We’ve been doing “Library” for quite a long time. We like to think that we’ve learned a thing or two along the way. Our mediaspace Approach is the culmination of the years of experience and expertise. We offer you this unique approach to help create a space that will be beautiful, functional and relevant for decades to come. With mediatechnologies furniture, we can guarantee it. A "one-size-fits-all" approach cannot work in the evolving role of the library aka media space. In a space that once was well defined, easily recognizable and rarely deviated from, we now face myriad variables. Our mediaspace Approach is a way to simplify the journey from where you "are" to where you "want to be". mediaspace puts all the pieces together. mediaspace fits. mediaspace will help guide you all the way. The absence of large bookstack areas indictaes that this scheme is weighted towards technology and media sharing and less reliant on the physical collection. “Scheme” has everything to do with the physical layout, function and flow of the overall space. What is the emphasis of the space? Weighted toward the physical collection? Balanced between bookstack and electronic media? Weighted toward technology, electronic media/connectivity and less reliant upon physical collection? The types of zones that you define and how you want those zones to work together will determine the scheme of your space. (We'll get to zones in a minute). Rich wood finish and a traditional high-design set the tone for this beautiful higher education library space. The “Tone” of your space is conveyed through the design of the furniture you choose and through your material selection for that furniture. The tone spectrum can be visualized if you imagine design and material selection as two axes. On one axis we visualize that the design parameter of tone can range from basic to very high design - from conservative to very “cutting edge”. On the other axis, we visualize material selection ranging from the comfort of wood to the multi-layered possibilities of laminates and powder coats. While this is a rather Cartesian example, it is easy to see that there are almost endless possibilities. We define a zone as a space that is designated for a specific activity and optimized with support items like furniture and connectivity items that enhance the activity. 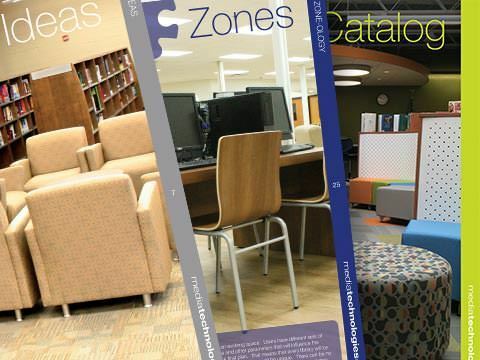 Every library or media space is comprised of zones. We define a zone as a space that is designated for a specific activity and optimized with support items (furniture, electronics, stuff…) that enhance the activity. Space + Activity + Support = Zone. An obvious example is a Bookstack Zone. This zone would naturally be a space with an arrangement of bookstacks, end-of-range units, incidental seating, etc. designated for the activity of browsing the physical collection. Simple. Think of zones as puzzle pieces that work together to create the adaptable space that is needed today - and for the future. The big visual difference between the “traditional” and the “contemporary” media space design is the increasing necessity of open space, adaptability and flexibility. 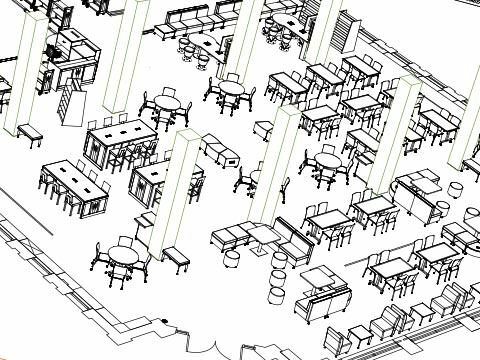 What we think of as a "traditional" library typically consisted of a Welcome Zone, Classroom Zone, Bookstack Zone, Quiet/Reading Zone and maybe a Display Zone. Those zones did not/could not change. Architecture typically defined - and limited – the use of that space. Additionally, there was no collaborative space – no flexible space. Today, optimization of every space to maximize the entire media-space-investment has become critical to the future of every library project. Space in the evolving library of today must be adaptable-to-change and flexible-in-use in order to truly maximize the investment throughout its life. 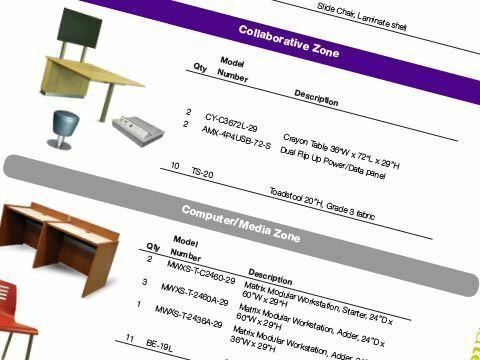 The goal of the Scheme-Tone-Zone mediaspace Approach is to provide the project team with a tool to visualize and plan the library space as a synergetic and adaptive arrangement of functioning zones. Remember the first time you used a power screwdriver for a task? You immediately understood what the right tool for the job meant. The job was accomplished quickly, easily, and without pain or the use of colorful vocabulary. 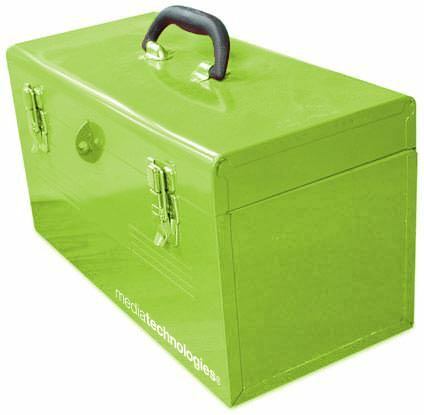 Think of the mediaspace Catalog, mediaspace Sales Binder and mediaspace Planning Questionnaire as your power screwdrivers. 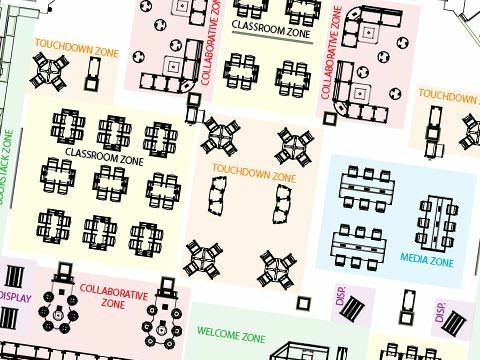 With the mediaspace Catalog, we have provided you with a tool that will help you and your project team to visualize and plan the media space as a synergetic and adaptive arrangement of functioning zones. The Ideas Section - provides a variety of snapshots of media space furniture and finish ideas. Look at what others have selected…what do you like? It is a place to get the conversation started. The Catalog Section – is your palate of furniture possibilities. Bring your project to life with selections from this broad range of products. There’s a lot of stuff in this section. The amazing thing is…each item is really only a representative example of what could be. Size, shape, material, finish and cost can transform every great choice into the ideal choice for your space. The mediaspace catalog provides you with a lot of possible puzzle pieces. The task is to define the zones and outfit them with the furniture that enhances the zone’s function, meets the budget and adds lasting value. The tone of your overall space will be communicated by the furniture styles and finishes you select. It's all here. How do the puzzle pieces fit together? How does this process work? The mediaspace Sales Binder is a guide that can help you through the zone planning and furniture selection for your media space. 3D representation of the overall media space. This is the type of drawing that we will provide your customer of the their project. 2D plan view of the space with color-coded zones indicated. We will also provide a plan view of your customer’s project. If you want color coded zones – we’ll do that too. See them in their natural habitat to give you an idea of what the furniture looks like. (Picture, Description, Quote) shows a representative image of each product, a quantity, model number and brief general product description and a unit list price by zone. The subtotal for each zone is indicated, plus the total for the entire space. This is a great tool to use to get a feel for available budget, furniture options, material and finish desires. The mediaspace Sales Binder gives you the head-start-benefit of using real project examples as a launching point into your cutomer’s project instead of a using blank canvas. Plus, it is an introduction into the mediatechnologies interaction process we use to design your customer’s space. 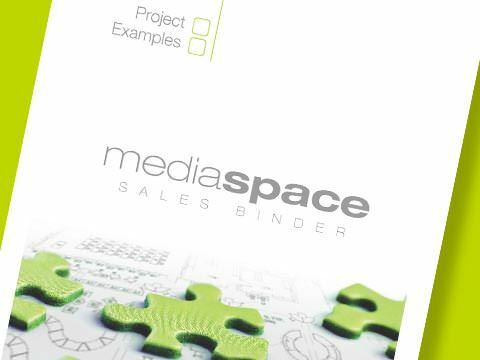 Use the mediaspace Catalog and the examples from the mediaspace Sales Binder to guide your customer safely through the perils of planning their media space project. These tools are guaranteed to make the task easier, less painful and accomplishable with much less colorful vocabulary. * Available for download with member login. The mediaspace Questionnaire can help get the ball rolling by helping you establish some hard facts about your space and its users. 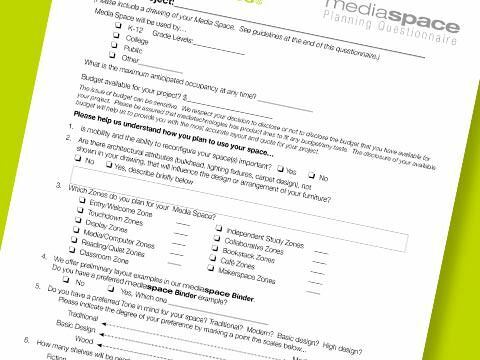 The questionnaire helps you think about and nail down some of the hard number details of your media space project. Use it when you are ready to move your project out of the idea stage and into a more concrete planning stage. Fill it out and send it to us. We can help get the ball rolling.